I'ts been a while since I've blogged, so I thought I'd do a bit of a catch up. It's been a busy period at Craft Arena; lots of workshops, the Minerva exhibition to prepare for and I've been making plans with Lisa McNally for our joint enterprise - working together towards an exhibition in 2017 and in the process recording our progress on our joint blog, Two hours with... and our Facebook page, where we show you what we have been playing with. We've had a bit of an hiatus over the last couple of weeks, but will be back playing with different media next week, so keep an eye out for our next posts. 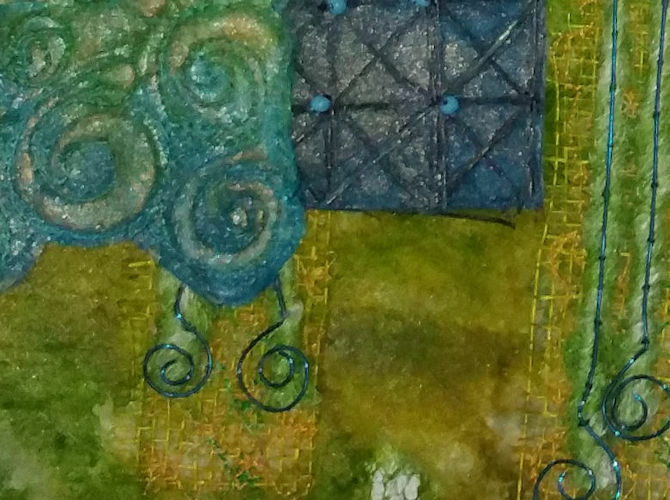 This is a piece I made using silk paper. The bits had been around for ages, left over from a class I did with Sarah Lawrence some years ago and didn't get round to completing. It is for our exhibition, so I've only shown a snippet. 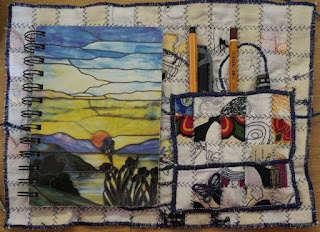 This is a sketch book wrap I made from of fabric that I had used to test out patterns on our Brother embroidery machines. I cut them into strips, wove them and machined over the top. 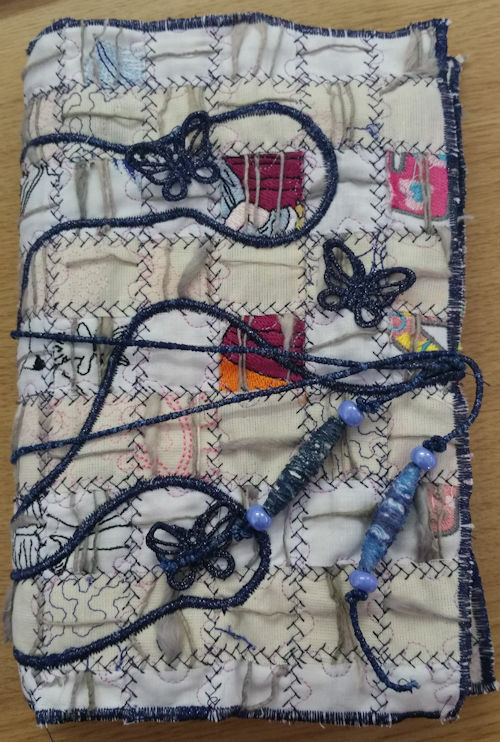 I added machine wrapped cord, embroidered butterflies and Tyvek beads to the front, and made some pockets for pens and pencils inside. I haven't put it on the wrong side by the way; I'm left-handed! It is bodged a bit - I didn't decide to add the pockets until I'd nearly finished - but as it's for me, it doesn't really matter. Inspiration seems to be my watch-word at the moment. 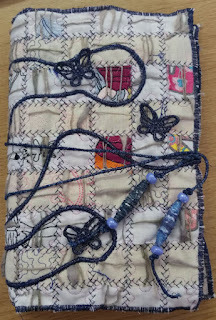 I went on a workshop with Bobby Britnell at the Knit & Stitch show, and she has inspired me to carry a sketchbook with me, something I haven't done for ages! I also did a workshop with Alysn Midgelow-Marsden, someone else who has inspired me over the years, and I'm hoping to use what I learned there in the next few months too!